For sharp-tongued food critic Miranda Wake, the chance to spend a month in Adam Temple’s kitchen to write an expose is a journalistic dream come true. Surely Miranda can find a way to cut the hotshot chef down to size once she learns what really goes on at his trendy Manhattan restaurant. The trouble is, she never expected Adam to find out her most embarrassing secret: she has no idea how to cook. Adam’s not about to have his reputation burned by a critic who doesn’t even know the difference between poaching and paring. He’ll just have to give the tempting redhead a few private lessons of his own – teaching her what it means to cook with passion…and doing more with his hands than preparing sumptuous food. This is Louisa Edwards first book and it is really good. I loved how we first meet Miranda when she is most definitely not at her best. It made a character that came across a little harsh, instantly lovable. Adam is wonderfully written. He is a character with as much passion for life as one can possibly have. Everything is an adventure to him, even though his first love is cooking. The scene when he first teaches Miranda to cook a poached egg is my favorite. I was a little put off by Miranda’s initial attitude in relation to her job and how, even though some people may be hurt, she was willing to do whatever necessary to achieve her dream. There is a m/m subplot that could turn away some readers. However, I found it to strengthen Miranda’s character and the story. I can’t wait to read more by this new fantastic author!! 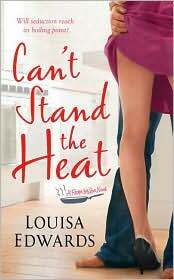 the book girl gives CAN”T STAND THE HEAT 4/5!